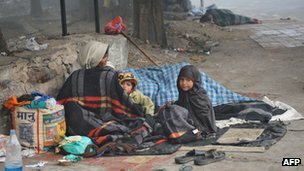 The death toll in a cold wave sweeping through northern India has risen to 39, media reports say. The majority of deaths were in the state of Uttar Pradesh. Punjab and Haryana are among the other northern states badly hit. Most deaths take place among the homeless and the elderly. Last week, the country's Supreme Court ordered states to provide adequate night shelters for the homeless during the winter. "You should not allow even a single person to die this winter from the freezing cold," the judges said. Heavy fog and a cold wind have disrupted life across northern India with sub-zero temperatures in Indian-administered Kashmir. Reports say nine people have died in Punjab and two in Uttar Pradesh since Sunday evening. The capital, Delhi, is also in the throes of a cold snap, with temperatures dipping to 2.3C and fog disrupting flight schedules. The cold wave has forced schools to shut in the state of Bihar until 25 December, reports said. An official from the meteorological department said the cold weather would continue for a number of days. Australia power into the Cricket World Cup final with a 95-run victory over defending champions India in Sydney.